I am writing to as a massive life long and devoted fan of Miss Saigon. 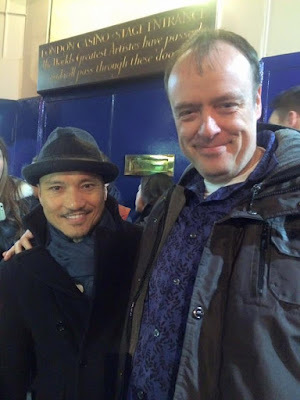 I have seen Miss Saigon over 60 times including attending the opening night in London, the UK tour, on Broadway, the 10th anniversary at Drury Lane, the closing night at Drury Lane and of course the recently held 25th Gala performance. I am also a big fan and supporter of the Philippines and Filipino people. I believe that the Philippines and Filipino people are incredibly talented and have so much to offer on the world stage. I first watched Miss Saigon at the Theatre Royal Drury Lane shortly after the opening when Lea Salonga was playing Kim with Monique Wilson. I am so glad that out of all those who auditioned you chose two Filipinas to play the lead roles. Not only that, as you know many of the original cast were Pinoy. Including of course Pinky Amador, Cocoy Laurel, Robert and Isay Alvarez Sena and of course the late, great Junix Inocian who took over as the first ever Asian lead Engineer at Drury Lane and developed the role as we know it today. May he rest in peace. 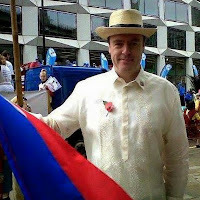 As you are no doubt aware, many of the original Filipino cast decided to settle in London, some cast members ended up marrying and of course having their own families, so of course generations of Filipinos were in some way established thanks to Miss Saigon and your support and vision in believing in them, such is its legacy. Of course with Jon Jon doing an incredible job playing the Engineer at the Prince Edward who was of course in the original production some 25 years ago as well as your most recent casting of the incredibly talented Eva Noblezada as Kim, the legacy continues. They will go on to Broadway of course as the magic continues there. Both Eva and of course Rachelle Ann Go, who both will be in Les Miserables both here and in Manila respectively. So I just wanted to personally thank you for supporting the incredible talents of the Filipino cast of Miss Saigon, many of whom I have become friends with, thanks to the advent of social media and Facebook. My own life has in some way been influenced and shaped through Miss Saigon. In fact when I first watched the show, I didn't even know where the Philippines was until I became a fan of Monique Wilson and travelled to Manila to watch her in a local production. In fact Monique has gone on to do great work and campaign for women's rights globally as well as of course helped to bring international theatre to the Philippines. So, although with a deep sense of emptiness and profound sadness over the closing of Miss Saigon at the Prince Edward theatre, I would just like to thank you from the bottom of my heart for giving Filipinos worldwide the chance to shine on the West End as well as international stage. Malcolm Conlan is a British Man with a Pinoy Heart. He works with Emergency Services.